Ground venison jerky is a thing. I actually had to learn this from my fellow deer hunters, who love the stuff. I was, initially, skeptical. Jerky, real jerky, is made from slabs of meat, not coagulated ground-up meat. 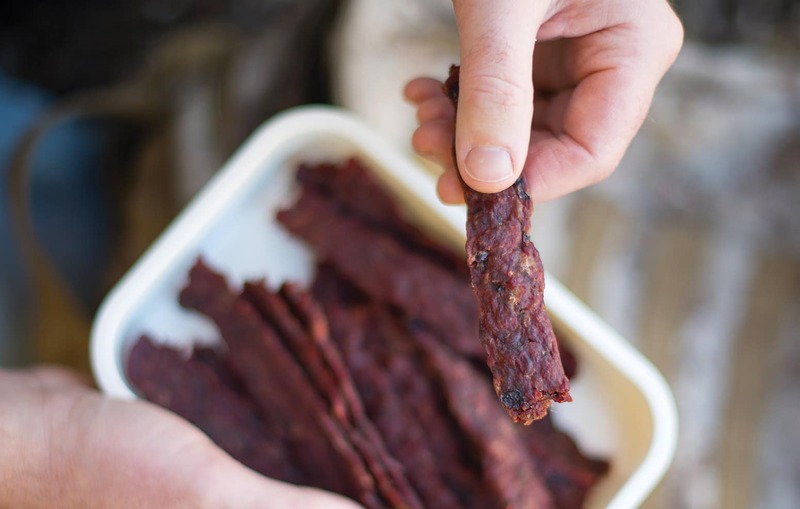 I saw no reason to go beyond my chipotle venison jerky, which my friends at Wired to Hunt have called the One Ring of venison jerkies; you’ll need to be a Lord of the Rings fan to get that joke. But hey, it’s popular, I thought. I should really do one. Then I remembered: I don’t bend to peer pressure. Screw ’em. Until I ate a Tanka Bar. is a pemmican-like bison bar made by the Oglala Sioux in South Dakota that’s available in some stores, and definitely online. One day I bought one at a truck stop in North Dakota while I was on the road, and it immediately changed my mind about ground deer jerky. Chewy, rich, with bits of dried berries and a hard-to-pin-down spice mix. This recipe is a hat tip to the Tanka Bar. I think I’ve reverse engineered it pretty well, and I am proud of this recipe, which first appeared in my 2016 book Buck, Buck, Moose. You can use any red meat here, or even dark meat off a wild turkey. I bet it’d be fantastic with prairie grouse, too, if you happen to have quite a lot of them. I prefer dried berries here, but you can leave them out if you hate them. Any dried berry will do: craisins would be the easiest to get (other than regular raisins, that is), but I prefer dried wild berries like blueberries, huckleberries, mulberries, lingonberries and such. You do need a special piece of equipment to really do this right, however. You need a jerky gun. It’s basically a caulking gun modified for food use. 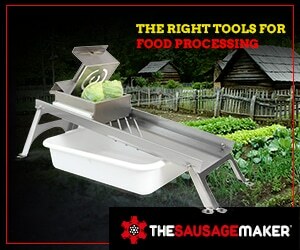 Several companies make them, but the one I use is made by The Sausage Maker. You also need a bit of curing salt to make this correctly. I use Instacure No. 1, which is also called Prague Powder No. 1. If you leave it out, it’ll be fine, but you won’t have ground deer jerky that tastes like a Tanka bar. I like to grind the meat and fat for this right before making the jerky, but any ground venison will do. You will want at least a little fat in the grind, however, because otherwise the jerky will be pretty crumbly and dry. If you don’t use bacon, you will want to increase the salt to 25 grams. And if you have smoked salt, you will want to use it. Grind the venison, bacon and dried cranberries through the fine die of your grinder. If you are using pre-ground venison, chop the dried cranberries well and add them to the ground meat. 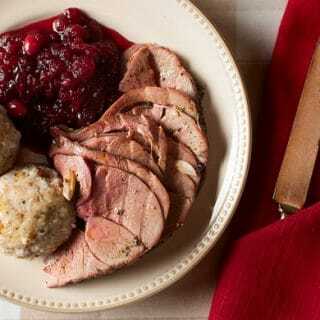 Put the meat and cranberries in a large bowl and add all the remaining ingredients. Mix well with your (very clean) hands until everything comes together and starts to stick to itself. If you have a vacuum sealer, seal the mixture and set in the fridge for 24 to 48 hours. If you don’t, pack the meat mixture into a lidded container and press some plastic wrap directly onto the surface and let it sit that way. The next day, separate the mixture into two or three chunks, depending on how big your jerky gun is. 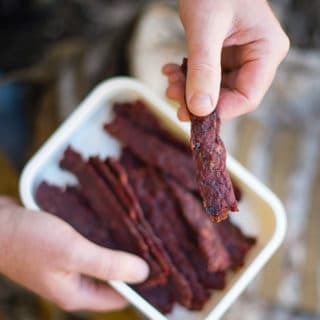 Pack it in and squeeze out lengths of jerky onto your dehydrator trays. Make sure they are separated from each other. Dehydrate at 150°F until the meat is mostly dry, but still chewy. If you don't have a dehydrator, you can smoke-dry it in your smoker, or in an oven set to "warm," with the door slightly ajar. In both of these cases, you want to keep the temperature as close to 150°F as you can. This sort of jerky doesn’t keep as long as traditional jerky because of the fat content. But it will keep for several weeks in the fridge, and it freezes well. NOTE: Time does not include curing time. Made this jerky yesterday… It’s delicious! I’m not a big fan of the “shoe leather” type jerky that requires gnawing forever to get it soft enough to swallow. I always end up with meat stuck between my teeth… this jerky is great, easy to chew, tasty and has a nice balance of sweet and spicy. I’m making more tomorrow… BTW I dehydrated my first batch for about 5 hours at my dehydrator’s meat setting ~145 deg (that’s as high as my dehydrator goes). I did use instacure #1 as called for in the recipe.